Imagine your PC or laptop had a port with a myriad of connection options and lots of raw power but you didn't even know it existed! That's what many computer owners must feel like these days. Purchasing a computer usually involves a welter of technical terms that are hard to sort out. And honestly, whose interest would spike if, along with disk size, RAM, processor and graphics card, the term Thunderbolt was suddenly thrown around? What is almost considered old hat in the Apple world is still a rarity among Windows users. 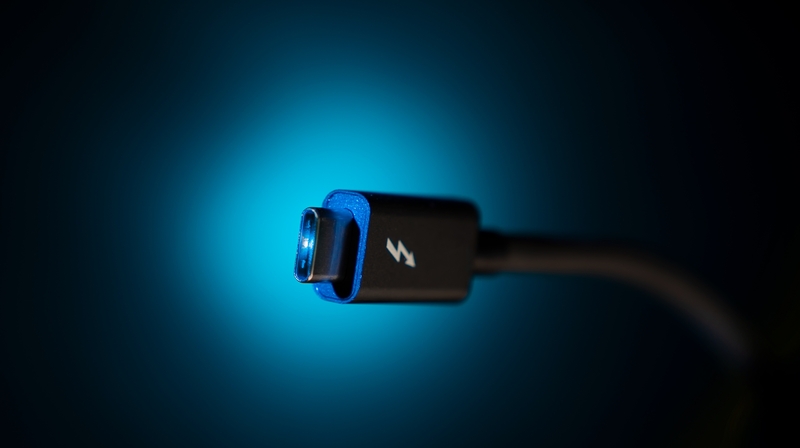 Thunderbolt is a high–speed hardware interface developed by Intel to connect external peripherals, like displays, hard disks or video cameras, to a computer. The current version is Thunderbolt 3, introduced in 2015 and part of many computers since 2016. On the outside, Thunderbolt looks like an unremarkable port, as a matter of fact, the way it looks already presents a problem. It looks identical to a USB C port! And even if you plugged in an ordinary USB cable, you wouldn't notice a difference since Thunderbolt is fully backwards compatible with USB 3.1. What if you could watch a 4K video on an external display, move around files at lightning speed and charge your cellphone with 100W all at the same time? 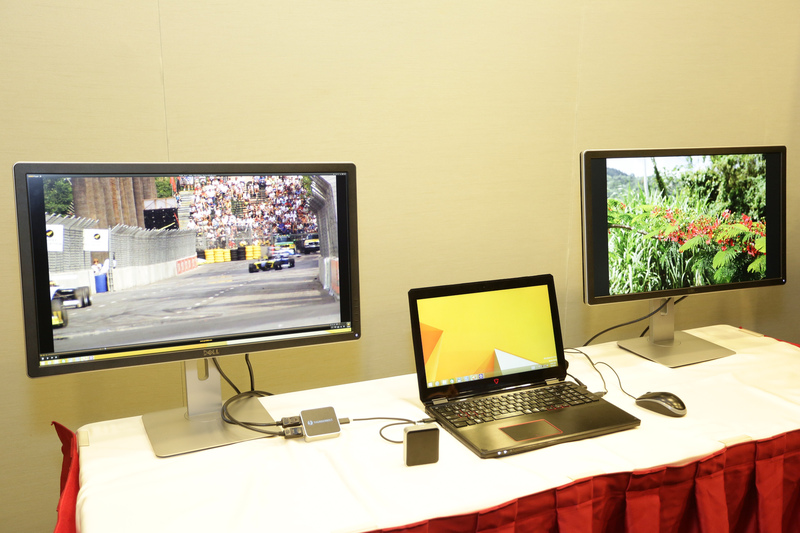 Thunderbolt 3 makes it possible with speeds up to 40 Gbit/s, enough to power even two high-res 4K displays. Theoretically, up to six devices can be connected through a hub or daisy chained. Thunderbolt reaches 4x the speed of the latest USB 3.1 Gen2 (10 Gbit/s max) and 80x the speed of the old, but still quite prevalent, USB 2.0. The interface is compatible with DVI, HDMI, VGA, DisplayPort 1.2 and even PCI Express – that's where things get interesting! You're probably all too familiar with the shortcomings of laptop computers: CPU and RAM are formidable – but the graphics card is a measly underpowered onboard chip. Putting a full-blown desktop GPU into a laptop is no light endeavor. That's why laptops have to compromise between poor GPU performance with good battery life or better graphics performance at the cost of portability, noiselessness and battery life. So why not use an external GPU? 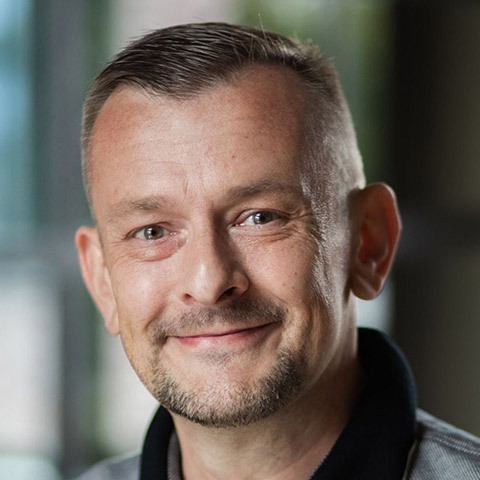 Until now, connection speeds were the deal-breaker, since modern GPUs require superfast data transfers. But with 40 Gbit/s, Thunderbolt 3 is already establishing a new device category. You can't just put a graphics processor unit (GPU) on your desk, plug in a power cable and start using the GPU. eGPU enclosures come with dedicated power supply units (PSU) and the same PCIe slots you'll find on your mainboard. Since fast GPUs have a high power consumption, built-in PSUs usually offer up to 400W of output. Visually, these enclosures resemble small servers and frequently feature additional network connectivity or extra ports for 2.5 inch drives. They start at €300 but graphics cards have to be bought separately, rendering the whole affair rather pricey! Naturally, eGPU enclosures connect to your laptop, or PC, via a Thunderbolt 3 cable, which brings us to the next problem. You probably guessed that, to profit from the speed Thunderbolt 3 has to offer, you need suitable cables. Ordinary USB C cables are of little use, unless you're willing to settle for less than 40 Gbit/s, which would defeat the whole purpose of eGPUs. Special Thunderbolt 3 cables come in two varieties: active and passive. To get the maximum speed, passive cables must not exceed a length of 50 cm. If you need longer cables, you'll have to spring for active cables that feature built-in signal amplifiers, and cost a pretty penny, naturally. And while these active cables work well with all eGPU enclosures, portable disk drives, like external hard disks, only run at slow USB 2.0 speeds and are more suitable for the (cheaper) passive cables. Many modern PCs feature a highly powerful port – that often goes unnoticed. Though my tests show the often-mentioned 40 Gbit/s are seldom achieved (it's a theoretical value, after all), there's no denying that Thunderbolt 3 is blazing fast! Regrettably, accessories that support the standard are expensive, the cables alone take quite a bite out of your wallet, not to mention the hefty price tags on network cards, eGPU enclosures, card readers and other peripherals, when compared to their USB-only counterparts. If you don't plan on gaming with your laptop and you don't need to transfer enormous amounts of data, Thunderbolt 3 is not for you (yet). The hardware simply feels overpriced. However, if you feel the need to play current games on your notebook, would like to hook up two 4K monitors or regularly run ginormous file transfers, Thunderbolt 3 offers the performance you need! What I would like to know: Is this the first time you heard of Thunderbolt? Are you already using Thunderbolt-enabled devices?